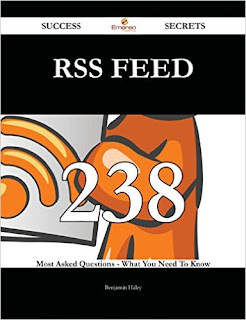 238 Most Asked Questions On RSS Feed. I am not going to explain in details about what a RSS Feed is. I presume every blogger knows and if in case, a blogger doesn’t know, he is not blogger yet Sorry to be blunt. I call myself an old time blogger who started blogging before many of the present day social media including twitter. I used to depend only web directories and RSS feed directories to promote my blog posts. With the advent of interactive digital marketing platforms, I am sure blog promotion through RSS feed is clearly overlooked. The RSS feed link on most blogs is usually so innocuous that blog readers are rarely even aware that it exists, so your first priority should be to make it more visible on your blog. Placing a large RSS feed button in a prominent place on you blog , adjacent to the subscription box and or along with the social sharing links is a good place to begin. Consider including smaller buttons for these links at the bottom of each blog post, plus a bit of text at the end of each post to remind people that the subscription and sharing options exist and to urge them to use them. It's also a good idea to include a bit of text below the feed subscription form explaining why it can make it easier for them to view your content in their email and how they can use it. Alternatively, you can create a separate page on your blog about the RSS Feed in general and its advantages to the blogger as well as the blog reader. By having a special page on your site with this information, you can link to this page in your blog posts and in your blog theme beneath your subscription and sharing buttons. Another useful way to promote your RSS feed is to use RSS feed directories. RSS feed directories are special directory websites that publish the contents of your RSS feed. It also means that any links to your content that are published with the feed will become backlinks to your website. Surely you know this will encourage search engines to index and rank your blog. Where to find RSS Feed Directory? It is very easy to find them by using the following search terms I Google. You can probably find many more ways to promote your RSS feed by using your imagination and looking for places where it would be appropriate to post the feed link.